Come visit The Green Bell Bed and Barn, a guest house and party barn with a rustic ring! 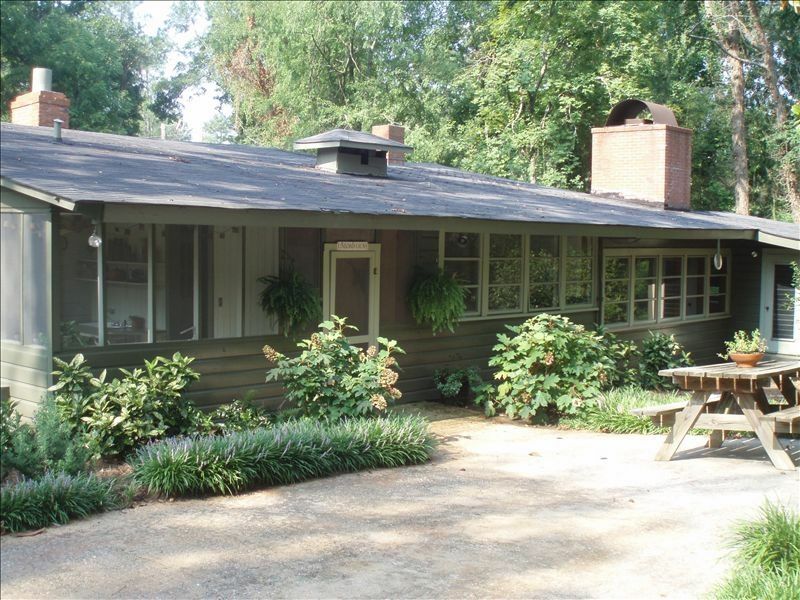 The Green Bell guest house offers clean comfortable accommodations nestled in a natural pocket of shady woodlands. The Green Bell includes the Party Barn, an ideal place to host most any social occasion. Whether you want to experience a relaxing weekend get-away, throw a party, or both: The Green Bell Bed and Barn will make it memorable. We are in the "HART" of Georgia, 4 miles west of I-75 and Perry, Georgia - just moments away from the Georgia National Fairgrounds and Ag Center. If you're the kind of person who enjoys sitting around an old pine dining table, or sipping coffee on the screen porch while you watch the birds, or cozying up to the fire on a chilly day, then the Green Bell is for you! Quirky and comfortable, come add your name to the long list of folks who have enjoyed our hospitality! Give a call and come on by. Very relaxing time with family. Even had an wedding engagement announcement occur. Added a member to our family officially. So glad your family had relaxing together time! Tucker was looking for y’all the other day, he’s always ready to play. Thank you for staying at the Green Bell. All the best to you and your family. Was traveling for work and rented this wonderful place. There were several people in our group and this place is roomy and comfortable Kitchen is awesome ! The History that is here with all the hunting and fishing pictures is amazing. Thanks Jenny your place is amazing! Thanks so much and am so glad you got some down time after the job. Take care and let me know when you’re back in the area. I really appreciate your business. This is a great location for a large family gathering. It was easy to find and definitely exceeded our expectations. The owner met us at the property and gave us a quick tour of the house and property using a map provided in the house. The property contains 2 ponds for fishing and the fishing was good. We caught several nice bass and bream and released them. The larger pond has a sandy beach area and an inflated tube with a trampoline that you can swim out to, although noone if our group braved the water. There is plenty of room for outdoor activities, which our group enjoyed to the fullest. I have nothing but good things to say about our weekend stay and hopefully we will be returning in the future.